807 Elm Street was not loved by many people. It wasn’t an ornate Art Deco or Mid Century architectural masterpiece. It never housed a famous retailer or impacted the City’s development. The struggles associated with the building’s demise does, however, offer a good study and warning for neglected structures within all historic districts and neighborhoods. 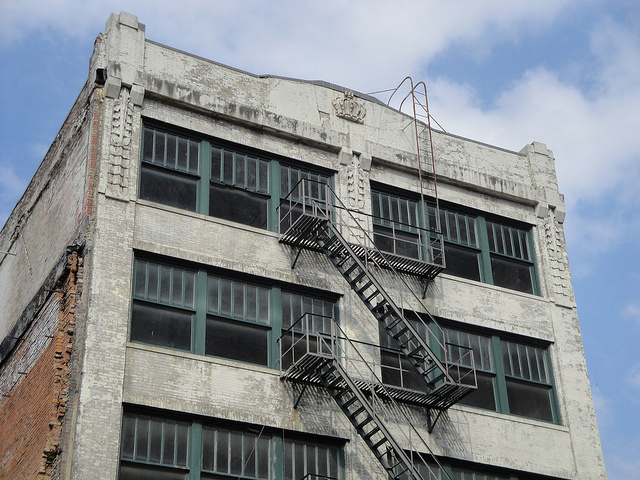 Despite being a contributing structure in the West End Historic District and listed on the Preservation Dallas 2005 list of Dallas’ Most Endangered Historic Places, the painted brick warehouse suffered from years of neglect due to changing ownership, unstable economics and unrealistic redevelopment plans. The result: the structure (one of 3 remaining from the Awalt Complex) will soon be replaced by a vacant lot and “hopeful” redevelopment. Despite having been saved from demolition once before, 807 Elm will quietly be hauled off to the landfill. This building — and those of the entire Awalt complex — are a symbol of the city’s struggle in finding new uses for its historic resources. Built in 1925, 807 Elm Street was part of a typical warehouse complex along the Pacific Avenue railway tracks and used by the C.A. Bryant Company, a wholesale school supply company. The building became part of a complex of 4 buildings – Located at 801 and 807 Elm Street, 800 Pacific Avenue and 208 N. Market Street – purchased by the Awalt family in 1939. Over the next 50 years they remained in use with the family’s furniture company until relegated to storage use in 1988. Occupying most of two blocks between Elm and Pacific streets, the complex came under much controversy in 1993 when the Awalt family decided to demolish the vacant structures and replace them with two parking lots; taxes and insurance costs were too high for structures that were no longer contributing any revenue. JMG Dallas Land, the company behind the sale, blamed redevelopment difficulties on the construction of the DART rail line along Pacific Avenue (a few years later the rail line would be labeled an asset for the property). The demolition plans ignited a community of preservationists stressing the importance of the vacant buildings as a gateway to the West End Historic District. Their concerns projected that loss of these structures — representing nearly 10 percent of all buildings in the West End — would threaten the area’s national historic designation. The City listened to these concerns and a moratorium was placed on the demolition. A compromise with owners resulted in the sale of the complex to the West End Foundation until a permanent buyer could be found to renovate the structures. 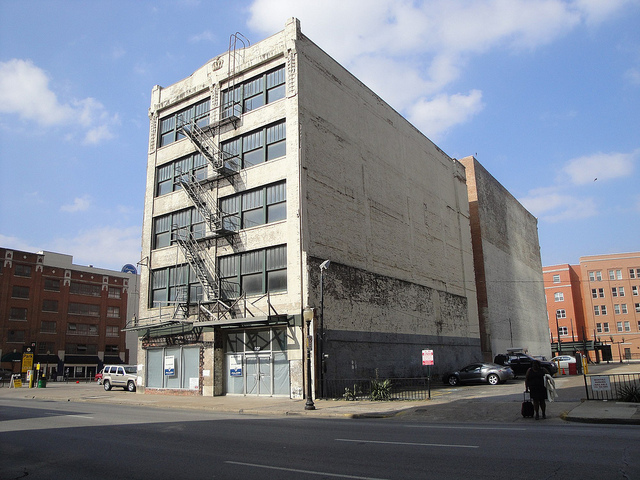 This setback delayed but did not cancel plans for redevelopment, although ownership of the three remaining buildings was later split between different companies (208 N. Market Street was successfully redeveloped). McKinney Avenue Properties purchased 807 Elm as part of the West End Square development in 2001; renovation and clean-up actually progressed for a while. Due to poor economic conditions, however, money ran out and the building ended up in the portfolio of PCB Properties (Park Cities Bank) under property foreclosure. In late 2010 Park Cities Bank went before the Landmark Commission requesting to “Demolish [the] contributing structure using standard imminent threat to public health and safety.” The request was denied by Landmark Commission’s Central Business District/West End Task Force, but months later was approved by the Landmark Commission when a structural engineer’s report detailed problems with 807 Elm. The structure was found to have serious issues that would likely prevent rehabilitation, although the decision by the commission (8-6) to allow demolition was not unanimous. The resulting decision allowing demolition angered residents invested in their neighborhood of downtown Dallas. Here remained a building at the gateway to their nationally-recognized West End Historic District — seemingly protected by years of discussion and redevelopment plans — allowed to be demolished due to owner neglect. While residents decided to rely on the judgment of the Landmark Commission and not proceed with the appeal process, they became concerned that a local business (Park Cities Bank) advocated the complete destruction of a building which contributed to the urban character and historic significance of their neighborhood. During the 1993 preservation fight the Landmark Commission stressed the importance of the buildings on the character of the West End, as mentioned in an article from the Dallas Morning News. The four buildings along Elm Street and Pacific Avenue make up about 10 percent of the West End, city officials say. If they’re destroyed, the area’s coveted spot on the National Register of Historic Places could be rescinded, along with lucrative tax incentives to invest there, said Trudy O’Reilly, chairwoman of the city’s Landmark Commission. The two buildings complete a set of historic buildings in the West End associated with the Awalt Furniture Company. The oldest building in the set is now rehabilitated, but these two buildings await rehabilitation while a fourth is already demolished. The Dallas Landmark Commission invoked the city’s demolition by neglect provision this past spring to encourage their stabilization. Although the buildings are not under immediate threat of demolition, the properties should be rehabilitated and made a stronger part of the central business district and until that occurs one or both may be recommended for demolition. Understanding that the lack of appeal allowed for demolition of the entire structure (which — as reports claimed — was now structurally unsound), the concerned citizens hoped that a compromise could be reached with the owner (as had been done in the past) to mitigate any impact this loss would have on the district. Unlike 1993, though, the requests for preservation were few and far between (even Preservation Dallas now supported demolition). Many people, having noticed the structure vacant for years, questioned the importance of preservation. Wouldn’t the site look nicer with the old building cleared away? The architecture of the building itself lacked any standout architectural features, typical of warehouse design of the period. It was just one of several early commercial buildings abandoned and forgotten about with no hope of redevelopment. A solution to preserve the facade for future development would have been ideal. Facade preservation is not unique, with examples common around the world. This would have allowed for demolition of the deteriorating structure behind while preserving the integrity of the historic district. 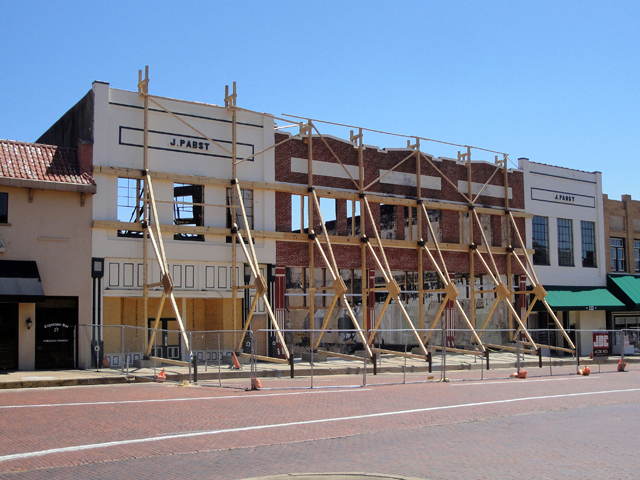 The entire facade could have been preserved in-place (similar to what is being done with buildings along the square in Tyler or the local Terilli’s Restaurant on Greenville Avenue) or disassembled completely for future reinstallation. While this is costlier than standard demolition, it preserves part of the urban framework that cannot easily be replaced with modern construction. Integrating the historic, cleaned-up facade with new surrounding development would have allowed for a vibrant, visually dynamic streetscape along this stretch of Elm Street. Unfortunately, Park Cities Bank wasn’t interested in considering this option. Advocates then pointed out that if was impossible to save the entire facade for various reasons (chiefly, cost), the unique crown elements could — with little expense — be spared from the landfill. This was done with demolished structures at Main Street Garden. A row of early twentieth centure commercial structures located within the Harwood Historic District were demolished for the construction of the new urban park. 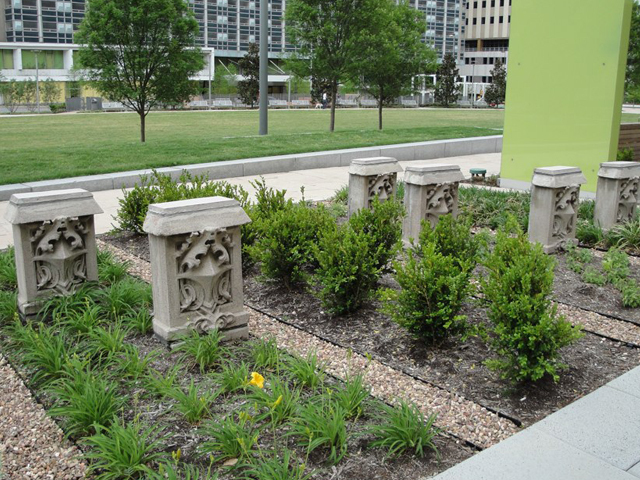 Various architectural elements were preserved and displayed in a garden area with interpretive signage, revealing a story of what was on the land previously. A similar solution could have helped tell the story of the West End through pieces of the facade. A new structure built on the site could have used these elements in future construction. Instead of a bland faux warehouse stretching the length of the block, historical elements (or reproductions cast from the originals) could have broken up the streetscape with historical reminders. The Dallas Center for Architecture mentioned that the crown, side elements and even bricks were worth saving. Yet again Park Cities Bank refused to cooperate with any preservation, and the Landmark Commission was bound by their previous ruling (which did not allow for any preservation stipulations). NBC 5 in Dallas ran a story about some of these citizen-requested preservation efforts. What can we learn from 807 Elm and its place in the urban environment? Should property owners be allowed to neglect a property for years with no enforcement from municipal officials? The City of Dallas recently enacted the Vacant Building Initiative, meant to address problem properties before they become a health and safety hazard. While this may return some structures to active use, some fear the ordinance may actually promote swifter demolition of currently vacant structures. Still, letting a building rot away is not something that should be tolerated in an area prime for redevelopment. If a contributing structure in a protected Landmark District can so easily be demolished, what precedent has been set for derelict historic structures (not in a protected district) around the city? The old Dallas High School, Knights of Pythias, and West End Marketplace are large structures that have been vacant for years awaiting another round of redevelopment plans. What action has the city taken to preserve and promote redevelopment of these buildings? In the Harwood Historic District — a similar Landmark District to the West End — the Masonic Temple, Tower Petroleum Building and 508 Park Avenue are all vacant structures that could seemingly meet the same fate of 807 Elm if allowed enough neglect. Should preservation be promoted over new development? Structural issues in older buildings are a valid reason for demolition, but that doesn’t mean the entire building must go to a landfill. Developers must be encouraged to preserve and integrate a neighborhood’s architectural history with the needs of today’s economy. A small structure disappearing here or there doesn’t get much notice, but over a long period of time most of the neighborhood’s unique qualities can be replaced with generic planned communities. Developers in the 21st Century need to be more creative with design, act responsibly with resources and engage the community they are entering. 807 Elm won’t be the last building in Dallas to fall, but hopefully its long demise won’t be repeated with other cultural resources in the City of Dallas. UPDATE: 807 Elm was demolished on March 12, 2011. Check out the coverage here. 2 Responses to "807 Elm Street"